In my previous post, I talked about how I first learned of the Hayduke Trail and came to the possibly insane decision to attempt it as a thru hike. Since it is a relatively young and little known trail, I wanted to give a brief overview of how this trail came to be and what to expect. The main place to get an overview of the HDT is on the Hayduke Trail website. The idea of the Hayduke Trail was concieved by co-creators Mike Coronella and Joe Mitchell in 1998. They spent years exploring the area to create a route that would accentuate the adventure and beauty of the Southwest. In 2005, Mike and Joe produced The Hayduke Trail Guidebook. It is slowly growing in popularity as more people hike the trail. This year about a dozen or more thru hikers will attempt the hike in each the spring and fall. What Mike and Joe have put together here is quite a beautiful thing. I have an interactive map posted later in this post for those more interested in the route. More of a route than a blazed trail, the two endpoints are about 200mi from each other as the crow flies, yet weaves for over 800mi through six national parks and many other wilderness areas. The trail is usually hiked from east to west in this order crossing these main areas. When Do People Hike the HDT? Being a desert trail, the fair weather window is slim with people hiking generally in the months of Feb-May in the spring and Sept-November in the fall. The guidebook has the route split into fourteen sections and each alone would make for a great trip, so it is an option to do sections of the trail. Those that thru hike the HDT tend to take 2-3 months to complete the trail and accept that there will be extremes in temps and weather. The Hayduke is more of a route than a trail. It’s lowest point is around 2000 feet in the Grand Canyon and the highpoint is Mt Ellen at 11,419 feet. It is not formally blazed, but Mike and Joe did their best to create a route that would follow preexisting trails. Connecting those trails are where the adventure will lie. It’s a combination of bushwhacking, scrambling (sometimes class 4), service road walking, paved road walking, weaving up, down, and through canyons, wading upstream for miles in cold waters, quicksand, boulder fields, and the fun of pour offs into pools of ice cold water of unknown depths. I know, crazy right?! Yes there are some inherent dangers to hiking in such a remote desert location. The combination of the lack of water, rugged terrain, and remoteness is one many are concerned about. 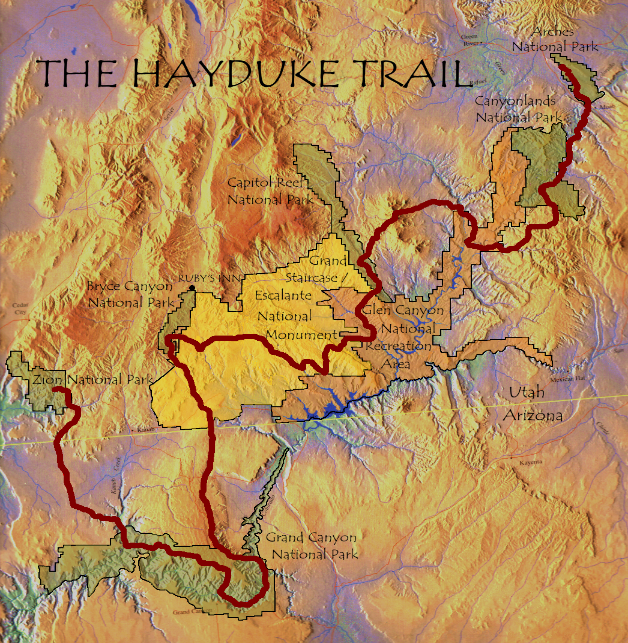 The Hayduke tends to be a trail that most do in pairs since there is a higher risk of injury or dehydration and little chance of others walking by in case of an emergency. I have upgraded to carrying a DeLorme inReach which is a device that works by satellite for me to be able to check-in whenever I want, text message if needed in an emergency, or use the SOS button in an extreme situation. I have to say that I am very happy that there are waypoints and tracks that have been developed over the years. I will have the paper maps, but it is nice to also have the ease of using a GPS. I’ll talk in more detail about the navigation, maps, waypoints, and tracks in upcoming posts. The HDT runs in extremes. There will be few times when temps will be moderate. I will either be freezing or sweltering most of the time. I am really not looking forward to the bitter cold nights when it can drop into the 20s and even teens. Getting out of the sleeping bag on those COLD mornings will be a challenge. It will be quite hot many days, but it can also stay cold with strong winds. It could snow one day and then be 100 degrees the next. Seriously! One hope is that the intense heat of the Grand Canyon will hold off until June as it can be upwards of 110 degrees there. It’s a balancing act as I’m starting fairly late (March 23rd) to get less of those frigid days, but it’s also a race to get to the Grand Canyon before that oppressive heat sets in. There is also the timing of snowpack on Mt Ellen as it’s a highlight of the trail and I don’t want to be forced into taking an alternate because I left too early and the snow is too deep. So far, it is a fairly low snow year, but lots can still happen in the spring. There are many possible alternates and side trips that can make for a wonderful variety of choose-your-own-adventure fun. The interactive map I have below shows the main route in red with some of the most common alternates in blue. Let me stress that there are MANY alternates and that the ones on the map are just the most common ones to make the map more aesthetically pleasing and understandable. I just LOVE this map from Trackleaders. It will also track other Haydukers that choose to sign up and it will be in my “Where’s Wired” tab to see where I am along the trail when I check in. Feel free to zoom in on the map as it is interactive and you can use the “Map” tab in the corner to change the type of map it is. Really fun! My plan is to take all the alternates in blue except for the central Escalante one unless the river is too high. It has been said that people should plan for the HDT to be a 1-2mph trail. There will many sections that, given the terrain, 1mph won’t even be possible. This is where research is essential as hikers need to know where these more time consuming sections are so that they are prepared with enough food and water. There will also be some stretches on trails or service roads that 3mph will be possible. There will definitely be a full range of experiences. Most days I will hike mileages in the teens and going over 20 miles will be a less common occurance. What About Canyoneering and Packrafting? The original route of the Hayduke does not require (does sometimes recommend) ropes or more technical canyoneering skills. Nor does it require packrafting. Though there is a fun raft hitch to cross the Colorado River in the Grand Canyon. There are alternates that can include more technical canyoneering and packrafting if people so desire, but I will not be doing those. There are some very long water carries on the Hayduke and there are few guaranteed sources with many being seasonal depending on rainfall. Depending on personal strategy, there is the option of caching your own water and food along the way. Hikers that cache food and water drive to locations before the hike and stash large five gallon buckets with food and water that they will later hike to. Caching is useful to lessen the loads between carries and allows for a more relaxed hiking experience with a lighter pack weight and less of a push to reach a water source or resupply location. It can make the hike much more enjoyable as hikers can then greatly reduce pack weight and relax more on the mileage demands. Though more challenging and risky, the hike can be done without caches. My plan is to hike without any caches. Many of the resupplies are 6-9 days and some water carries require ~8L of water, which would be 16lbs of water. The sources (sometimes just a small shallow pool) are not ideal with many sources having some degree of silt or alkalinity(gives you the runs!). Oh boy! As I mentioned before, many of the food carries will be long since I will not be doing any caches. Many of the resupplies will be 6-9 day carries. The HDT is in a very remote area with few opportunities to get to towns. This will just add to the fun as that also means less showers and laundry. C’mon, doesn’t it sound like fun!? Due to the remote nature of this trail, there will be little phone and wifi reception. Yes, Wired will be unplugged! I will do my best to load the daily blog posts when there is service, but there will be a delay most days. Do not worry as each post will still be written each night to get the immediate reflection for how my day went. My goal is to do my best to have everyone hike the trail with me so I’ll get the posts up as soon as it’s technologically possible. I also plan to do more videos like I did on the PCT and CDT and those will be uploaded in bulk on zero days every 3 weeks or so. I know my descriptions here are less than ideal, and that is why so few hike the Hayduke. It is definitely not a comfortable trail, but those that have done it, often say it’s the most adventurous, insane, and EPIC experience they’ve ever had. Again, just look at these pictures from HDT thru hiker Nic Barth! It will totally be worth all the effort. I like challenges and I especially like hikes where the efforts match the reward. I like having to work for that view and earn it. Another pro for the difficulties of the Hayduke is that it keeps the crowds away. The idea of going days without seeing a car or other hikers is very enticing and I’m really looking forward to that aspect of the hike. It’s going to be quite the journey!